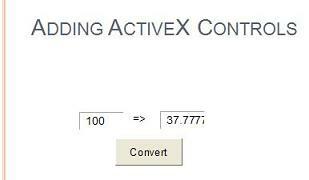 How to add ActiveX controls, like text command button, text box, check box, etc., to Presentation slides? I want to make my presentation more interactive to allow viewers to fill in values in text boxes and click command buttons to trigger some actions. Can I add ActiveX controls to achieve this through some programming codes? 2. Select the Text Box icon from the Controls menu group, then press and drag the mouse to create an ActiveX control text box on the slide. 3. Click the right mouse button on the text box and select Properties from the context menu. You see the Properties box showing up. 4. Change the value in the (Name) field to "Temperature". Then change the value in the Value field to "32". 5. Repeat the process to create another text box with name of Result and value of "?". 6. Select the Command Button icon from the Controls menu group, then press and drag the mouse to create an ActiveX control command button on the slide. 7. Change the value in the Caption field to "Convert" on the Properties box of the command button. 8. Click the right mouse button on the command button and select View Code from the context menu. You see the Microsoft Visual Basic window showing up.